Many younger generation of parents like to give their kids an English (or more commonly known as Christian, Englishised or western) names, irregardless of whether they are Christians or Catholics or not. This phenomenon is especially pronounced in the Chinese community (as one forumer commented: it seems Chinese worldwide are using it esp Taiwanese, Hong Kongers, Singaporeans and lately mainlanders) and a small minority in the Indian and Malay communities as well. I wonder are Chinese more susceptible to cultural attack? It is a free country and anybody can call whatever names they like for themselves or their children, just that please spare some thoughts for the poor kids who may have to bear some unusual annoyance due to the poor choice of the names by their parents. Some of the ridiculous and famous ones are Monica Chng (touch your backside in Hokkien), Jasmine Gwee (What are you eating? ), Michael Tan (egg seller in Cantonese). But the trend lately is many young generation of parents are outdoing one another by “inventing” new names by changing a letter or two to make it “uniquee“.E.g “Andy” becomes “Andi”, “Andee”, “Sky” becomes “Skye”, “Jason” becomes “Jaesson”, “Celine” becomes “Celinee”, “Celin”, “Celyn”,”Selyn”, “Romane” becomes “Romanne“, “Jayden” becomes “Zayden“…. 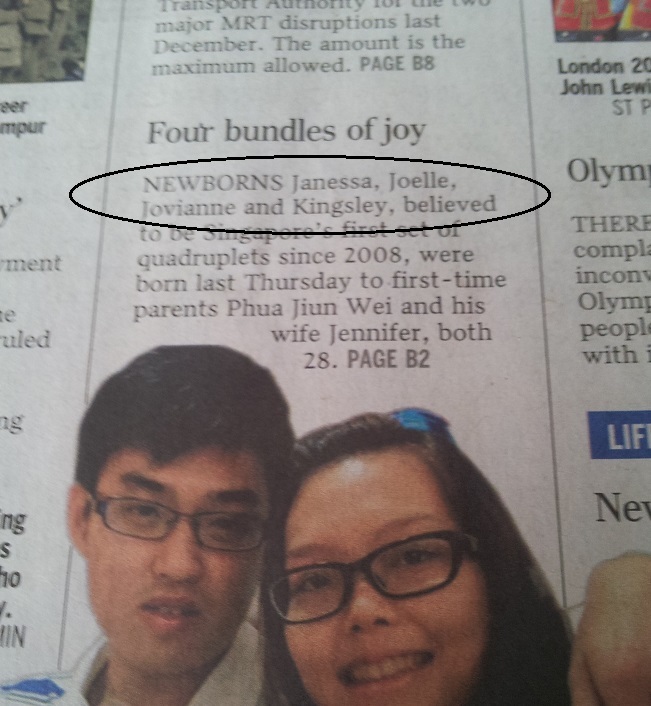 Yeah how “innovative” some Singaporeans are when come to naming their children or themselves. Lack of self-esteem perhaps? Trying too hard to stand out from the crowd? Honey,Atomic, Nuclear,Baby, Ezekie, Izael, maximus, visa, Faymond (a play on Raymond),Sixx (??? ), Agatha, Abcde (he or she? ), Trenice, Joash, Jaelle (With a mother who prefers to call herself Madeline instead of Madeleine or Magdalene, you understand why the unusual names for her kids). More weird and tongue twisting Singaporean names can be found in the ST’s article “Hello, my name is Abcde: How millennial parents are creating tongue-twisting names for their children“. Some of the weirdest English names that Askmelah has come across from the younger generation of mainland Chinese include:Welcome, Lipton, Summer, winter, spring, German, Lotus, Olympics, Vitamin, Tiger, Flower….. When 24-year-old Rachel Siu was looking for a name for her son, she went to Greek mythology for inspiration, searching through names of gods and emperors for something “bold and different”. The mass communications student’s online search led her to the Greek god of flowers, Dianthus, whose spelling she modified to Dyanthus for a twist. She, her husband and son currently live in Perth, where she is studying. The name is supposed to be pronounced Dee-an-thus. The two-year-old boy is also having a little trouble saying his own name, but his mother has no regrets. “His name is a conversation starter and I’m sure he will grow up to appreciate it. Rest assured, I’m going to name my future kids something unique as well,” she says. For many millennial parents, “unique” is the magic word when it comes to naming their children. Drawing inspiration from diverse sources such as the hit HBO fantasy series Game Of Thrones and popular celebrities, and freely mixing up the spelling to create tongue-twisting, phonetics-defying new words, these parents want a name that no other kid would share in the playground. So goodbye to John and Jane, and hello to Matz, Ckash, Zoen, Zeremy and Abcde (pronounced Ab-si-dee) – which are not typographical errors, but the tricky names that Ms Sherlyn Chan, 28, a teacher at enrichment centre The Learning Lab, has encountered in her young students. Having worked for five years now, she is used to these creative new names. More people around the world are giving unconventional names to their babies. In a report about millennial mums released by Goldman Sachs last May, research showed that fewer babies are being given “popular” and “traditional” names. In 1940, the top five male baby names accounted for 20 per cent of all male babies born in the United States. In 2014, that figure dropped to 4 per cent. The report attributes the change to “greater diversity among parents” and an “appetite for more differentiated and unique brands”. Some parents adopt “special” names wholesale. Ms Rosemary Chiang, 31, a personal assistant, decided to name her son Rhaego (pronounced Rah-he-go) after a Game Of Thrones character because she was drawn to the warrior-like strength of Rhaego’s mother, Daenerys Targaryen, on the show. Other parents choose to modify a traditional name by changing a letter or two because, well, a Rozze by any other spelling would smell just as sweet. For four-month-old Zyeaad (pronounced Zi-yad), his housewife mother Farah Tan says she was drawn to the Arabic name Ziyad, which means abundance. “To keep things interesting, we changed the spelling to Zyeaad so that it looks unique,” she says. 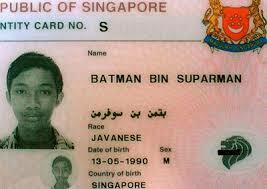 Despite a parent’s best intentions though, children do not always love their special names. University student Annastassha Evangelis Dodwell, 20, whose name was inspired by the name Anastasia and supermodel Linda Evangelista, remembers disliking her name immensely as a child and asking often to have it changed. “I’ve grown to love my name now, but I really didn’t when I was younger. Not only was it difficult for people to pronounce, I also thought it was just too long and troublesome to write,” she says. Her father is Sinhalese and her mother is of Malay-Chinese parentage. Digital marketer Ailsa Khee’s name is of Scottish origins and is pronounced A-li-cia. She had schoolmates call her by her Chinese name, Hui Jia, so people would stop mispronouncing her name. “People still stumble over my name 99 per cent of the time – often calling me Elsa or Ali-sah. I’ve gotten so many variations of my name that I’ve lost count,” says the 28-year-old. Still, some children have owned their stand-out names with pride. Take musician and actor Zephyr Khambatta, 28, who says that his consonant-heavy name has given him a slight edge in the cut-throat entertainment industry. That said, his name is at least a real word: Zephyr (pronunced “zair-fur”) means gentle breeze. He says: “I am so used to correcting people’s pronunciation of my name.